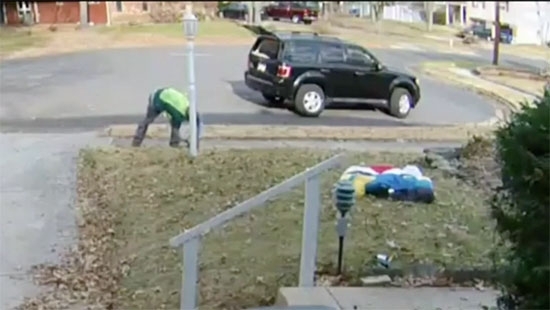 Mount Laurel police are searching for a Grinch who was caught on surveillance video stealing Christmas lights from the front of a home. It happened on Thursday afternoon, November 30th at 2 p.m. on the 300 block of Heather Drive. The Segrest's home was decorated with an inflatable Minion, lights on shrubs, and a laser light that shines on the side of the house. Michelle Segrest described it as "green and red lights that move around." The video shows the thief pull up in front of the home in a black Ford Escape. They get out, walk up to the light, unplug it, and then walk back to the car with it. The SUV did not have a front license plate and may have had a temporary New Jersey plate on the back. If you have any information you should contact Mount Laurel police. A toddler was injured after falling from a balcony inside a Society Hill restaurant on Saturday night. It happened around 8 p.m. at Pietro's Coal Oven Pizzeria at 121 South Street. The 16-month-old boy fell about 10 feet from the second floor. He was taken to Children's Hospital of Philadelphia and is in stable condition. Police are investigating the incident. Police are searching for two suspects wanted for beating and robbing a man in Northeast Philadelphia early on Saturday morning. It happened after midnight at the Revere Court Apartments on the 7200 block of Revere Street in Mayfair. The 28-year-old victim, who works as a security guard, was outside smoking when two armed men forced him into his apartment. They handcuffed him to the refrigerator with his cuffs and proceeded to beat him. The pair stole his TV and sound bar, $200 cash, and a body armor jacket he uses for work. The victim was taken to Aria Torresdale Hospital and was treated and released.